This week’s featured photograph from my Creative Sparks creativity workshop is by Bill Lord. Bill recently began coming to Creative Sparks after taking a long hiatus from photography. Here’s a photograph he made over the weekend while exploring a local scrapyard with his camera. Bill has an affinity for abstract photographs like the image seen here as well as images manipulated into the psychedelic realm using photo-editing software such as Photoshop and NIK. 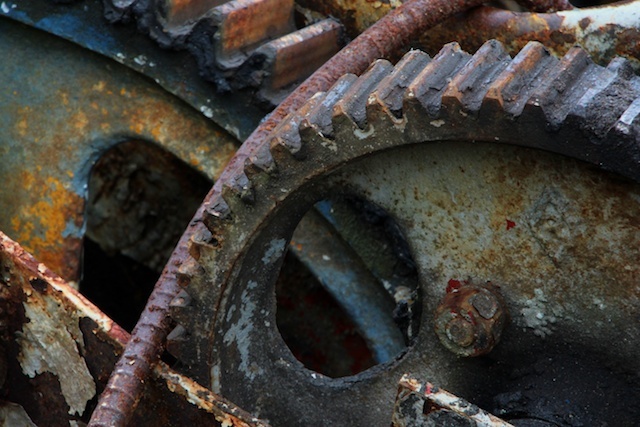 This straight color photograph presents an interesting contrast between the “once mighty” steel gears which are sharp and bold in the foreground and the soft rust reclaiming the mighty machine. The color palette of the photograph is very warm and inviting, a sharp contrast from aggressive gears and the rebar which seems to have jammed any possibility of mechanical progress. Bill’s background in music, art and the humanities comes through strongly in his photographs.